Laser Therapy has been successfully used to treat a broad range of medical conditions, including musculoskeletal problems, arthritis, sports injuries, post-surgical wounds, diabetic ulcers and skin conditions. Low-Intensity Intensity Laser Therapy uses red and infrared light for the relief of pain, to accelerate healing and decrease inflammation. When the light source is placed against the skin, the photons penetrate and are absorbed by mitochondria, the energy-producing part of a cell. This facilitates tissue repair and accelerates wound and tissue healing. Low-Intensity Laser Therapy is non-invasive, non-toxic and often provides a treatment alternative for patients that have not responded to other therapies. What makes Light Therapy so effective? LILT jump-starts the body’s natural healing process. Unlike drug treatments that mask pain or only address symptoms, Low-Intensity Laser Therapy treats the underlying condition to promote and accelerate healing. Treatments are very effective and the benefits are long-lasting. Treatments can last between 15 minutes to over 1 hour depending on the condition and area being treated. 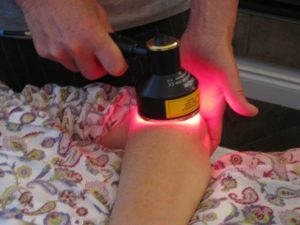 The number of treatments vary as every patient and condition responds to Laser Therapy uniquely. A free consultation will help you better understand your treatment plan. The Toronto Raptors, Maple Leafs and the Blue Jays, the Miami Heat, the Canadian National Ballet Company along with many other high-performance organizations utilize laser therapy technology as the basic treatment platform for athletic injuries. Lakeside Health (Shuswap Acupuncture) has 10 years of experience with laser therapy. Lakeside Health (Shuswap Acupuncture) has 10 years of experience with laser therapy. LILT could be the answer to your chronic pain and healing.